The SF 971-T Thermostatic shower is no longer available, a great new replacement is the SL5 recessed thermostatic shower valve. IMPORTANT: Pipe centers for the old SF 971-T were 138 - 175mm the new SL5 pipe centers are 130 - 160mm, If this is an issue then please call our helpline. Thermostatic mixer shower that maintains precise temperature control to + or - 1ºC ensuring safe showering. Single lever controls both temperature and flow adjustment. 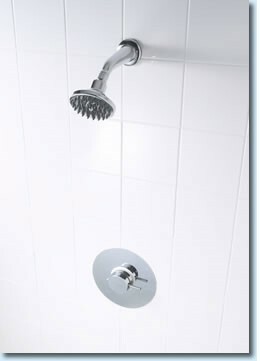 Minimalist style showerhead includes rub-clean nozzles for easy maintenance. Brass body ensures longevity in hard water areas.